Virgin Australia has been named as Best for Onboard Beverages at the Onboard Hospitality Awards 2017, held in Hamburg this week. The airline received the global award for The Duo, a customised wine developed in partnership with Barossa Valley winery St Hallett and Fine Wine Partners specifically for consumption at high altitude and to compliment ‘The Business’ menu designed by Virgin Australia resident chef Luke Mangan. Virgin Australia’s General Manager In-flight Experience, Tash Tobias, said: “Our team is always searching for ways to deliver an outstanding experience for our guests in the air and to promote the ingenuity of Australian winemakers and producers. “We are thrilled that the work of our In-flight Experience team and St Hallett winemaker Shelley Cox has been recognised with this prestigious award,” Ms Tobias said. The Duo is served in ‘The Business’ on board Virgin Australia aircraft and in Virgin Australia lounges. 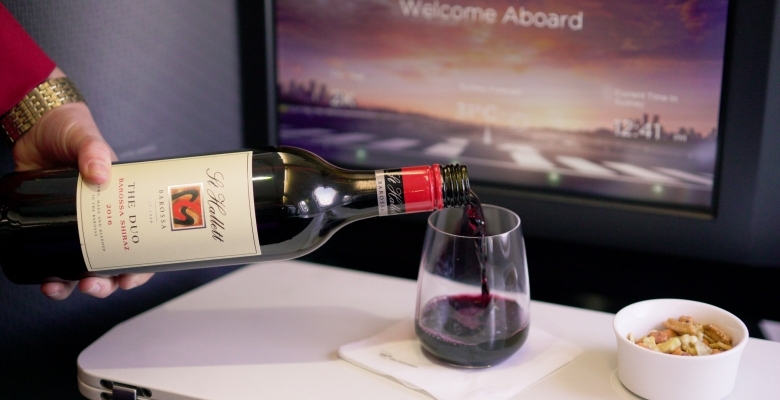 Virgin Australia proudly serves a premium selection of Australian wine on all flights. The Onboard Hospitality Awards are organised annually by Onboard Hospitality magazine and celebrate excellence and innovation in air, rail and cruise.